Helmut Newton Would Be Proud! The New York Times Magazine: The Court-esans. Russian tennis never looked so good! 'Life' Photographer And 'Shaft' Director Broke Color Barriers. Gordon Parks, a photographer, filmmaker and poet whose pioneering chronicles of the black experience in America made him a revered elder and a cultural icon, died yesterday at his home in New York. He was 93. His nephew, Charles Parks of Lawrence, Kan., said Parks had cancer and had been in failing health since 1993. Parks, the son of a dirt farmer, rose from meager beginnings and above recurrent discrimination to walk through doors previously closed to African Americans. He was the first black person to work at Life magazine and Vogue, and the first to write, direct and score a Hollywood film, "The Learning Tree" (1969), which was based on a 1963 novel he wrote about his life as a farm boy in Kansas. 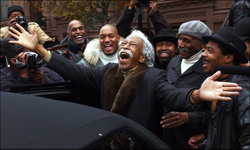 He also was the director of the 1971 hit movie "Shaft," which opened the way for a host of other black-oriented films. Elegant and aristocratic with a trademark mustache, his work traversed a vast landscape from poverty and crime to luxury and high fashion. He was a high school dropout turned award-winning photographer who traveled the world, using his camera with deftness and defiance. "I didn't set out to do all that I did," Parks told an interviewer. "I think there was always fear -- fear of not being educated. All the things I did were done because of the fear of failure." - Yvonne Shinhoster Lamb, TWP; Photograph by Suzanne Plunkett, A.P. Scarlett - New York Times.